Yoga is the way to realize the ultimate truth referred to in Vedanta and universal energy field in Quantum physics. The sublime and imperceptible truth of Vedanta is made more concrete through Yoga. It is the launching pad for one’s journey into inner space. Yoga is the key that opens the floodgates of happiness ‑‑ for an individual as well as the community. It annihilates the personal and collective misery that comes through individualistic and egoistic tendencies. Yoga not only brings mundane benefits such as health and vibrance, but also uplifts the spirit and enhances intuitive ability which is much needed for governance. It brings skill in action, helping one manage challenging situations without getting stressed. Every child is a born yogi. Till the age of three children all over the world naturally perform many yoga postures and mudras. The baby’s state of mind and breathing patterns are very similar to that of a yogi. Yoga brings up that child-like beauty and innocence in us. It is a very well known fact that yoga has helped countless people recover from many illnesses. In an instant, it can bring about complete balance in one’s personality; it corrects extreme complexes and tendencies. In fact, yoga holds out the promise of many solutions that today’s behavior sciences are looking for. When people have a glimpse of the meditative experience their life gets totally transformed. We have seen this in prisons also- when the inmates start with basic pranayama, they move into meditation easily and their character starts reflecting the yamas and niyamas (the social and personal codes of conduct as enunciated by Maharishi Patanjali). From militants and prisoners to monks and poets, yoga can radically transform the lives of people in ways inconceivable. It softens the heart, sharpens the intellect and clears confusion. In this century, when depression is one of the biggest challenges the world faces, yoga is undoubtedly the best app that everyone must download in their life. Like science, sports and culture, the philosophy & discipline of yoga also need state patronage to flourish. After so many years of being denied its true place in the guise of secularism, it is highly refreshing to see yoga receiving strong thrust from our Hon. 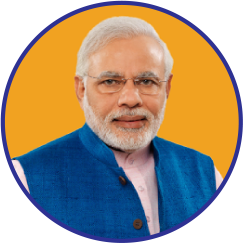 Prime Minister Sri Narendra Modi.